L.I.N.K.S. 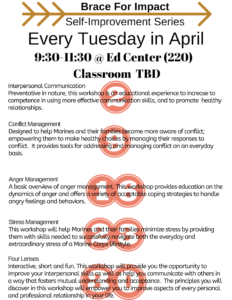 is a class developed by spouses to introduce new member to the Marine Corps family. It’s the “I wish I’d known…” class full of tips and trick about the Marine Corps Lifestyle. We talk about everything from what to do at colors to what different pay would look like at different duty stations. This is not only the knowledge you need, but the opportunity to get a great positive spin on the rest of your time with your Marine. Currently offered in traditional and “mommy & me” style. See this PDF for the L.I.N.K.S. Brochure (6MB). Once you’ve gone through the class you’re welcome to become part of the training team. Get a great experience volunteering, and pass on your knowledge to others. This is our newest development. A 3-hour tour from our office highlighting the resources on this base and the ways to get connected while in Hawaii. This is for those who have taken L.I.N.K.S. before but just want to get to know the local area.